Something fishy is going on almost everywhere in the Eastern Sierra! Plan your trip to your favorite Mono County fishing spot around this year's derbies, events and festivals. January 1 - April 16: Topaz Lake Fishing Derby - Topaz Lake. The fishing season at Topaz Lake (California-Nevada border) goes from Jan. 1 - Sept. 30, 2019! Topaz Lodge hosts their annual fishing derby from Jan. 1 until April 14 -- catch tagged fish for cash and prizes. No entry fee! Contact Topaz Lodge - (800) 962-0732 for more information. April 27- General trout season begins - also known as "Fishmas"! April 27 - Fishmas Day Celebration at Tom’s Place. A fun-filled fishing derby with cash prizes, 50/50 raffle for cash, and lots of contest categories. Advance registration required. Contact Tom&apos;s Place Resort - (760) 935-4239 for more information. April 27: Monster Fish Contest - June Lake Loop. Prizes will be awarded for biggest trout caught by a local resident, biggest trout caught by a child, biggest trout caught by a woman, and the ugliest trout entered. Contact the June Lake Loop Chamber of Commerce for more information. April 27-28: Annett’s Mono Village Fishing Opener Derby - Upper Twin Lakes, Bridgeport. Cash and merchandise prizes given in several categories. Registration fee required. Contact Annett&apos;s Mono Village - (760) 932-7071 for more information. April 27 through November 15: Gull Lake Marina "Fish of the Month Club" Derby - June Lake Loop. Cash prizes are awarded for the biggest catch from Gull Lake every month of fishing season! Entry fee is just $5. Plus, rent a boat from the marina and catch a fish over 3lbs., and you get to spin the Wheel of Prizes! Contact Gull Lake Marina - (760) 648-7539 for more information. April 27 through November 15: Bridgeport Locals Only Fishing Tournament - Bridgeport Reservoir. Contact Ken&apos;s Sporting Goods - (760) 932-7707 for more information. April 28 - June 16: "Round-up at the Lake" Spring Fishing Derby - Convict Lake. Cash prizes up for grabs; advance registration required. Contact Convict Lake Resort - (800) 992-2260 for more information. May 24 -June 24 : Crowley Lake Perch Derby - Crowley Lake. Contact Crowley Lake Fish Camp - (760) 935-4301 for more information. June 1 -3: "Hangman&apos;s Cash Weekend" Convict Lake - Convict Lake. Cash prizes up for grabs; advanced registration required. Contact Convict Lake Resort - (800) 992-2260 for more information. June 15-16: Fred Hall Father&apos;s Day Fishing Tournament - Mammoth Lakes Basin. Be part of the Fred Hall tradition by participating in the Father’s Day Derby. Fish in the Mammoth Lakes Basin then weigh your catch at Rick’s Sports Center at 3241 Main Street in Mammoth Lakes for a chance at winning an awesome prize package! Contact Rick&apos;s Sports Center - (760) 934-3416 for more information. June 22: Rush Creek Clean-up and BBQ - Silver Lake Resort. Contact Silver Lake Resort - (760) 648-7525 for more information. June 22: Bridgeport Trout Tournament - An open derby with several categories, funds generated from this event help provide more trout for Bridgeport Reservoir and the East Walker River. Contact the Bridgeport Fish Enhancement Foundation, Ray(760) 616-4214 or Ken (714) 227-0765 for more information. June 29: Department of Fish & Wildlife&apos;s Trout Fest - Hot Creek Hatchery. Free for kids, instruction, activities, casting lessons, insect display and more. Contact the Dept. of Fish & Wildlife for more information. June 29 - July 7: Mono Village 4th of July Fishing Derby - Upper Twin Lakes, Bridgeport. Cash and merchandise prizes given in several categories. Registration fee required. Contact Annett&apos;s Mono Village - (760) 932-7071 for more information. 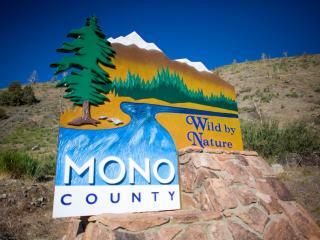 July 6: Free Fishing Day - Come and fish for FREE in Mono County! All regulations still apply and Report Cards are required -- but Fishing Licenses are waived on this day (and again on September 1, 2018). For more information on Mono County fishing regulations, contact the California Department of Fish & Wildlife at (760) 934-2664 or visit the website for more information. July 1-31: How Big is Big Fishing Derby - West Walker River. Sponsored by the communities of Walker, Coleville and Topaz, and the Northern Mono Chamber of Commerce, the How Big is Big Fishing Derby runs for the entire month of July. No entry fee -- just bring your fish in to the Walker General Store, and your catch will be weighed and recorded. Lots of prizes. Contact the Northern Mono Chamber of Commerce for more information. July 27 – August 4: Mono Village Summer Fishing Derby - Upper Twin Lakes, Bridgeport. Cash and merchandise prizes given in several categories. Registration fee required. Contact Annett&apos;s Mono Village - (760) 932-7071 for more information. July 27: Kids Fishing Festival - Snowcreek Resort Mammoth Lakes - Kids under 12 can catch an Alpers trout at Snowcreek ponds. Event T-shirts, prizes. Contact the Kids Fish Fest - (760) 937-2942 for more information. September 7: Crowley Lake Stillwater Classic - Crowley Lake. Contact Crowley Lake Fish Camp - (760) 935-4301 for more information. August 31: Annett’s Mono Village Labor Day Fishing Derby - Upper Twin Lakes, Bridgeport. Cash and merchandise prizes given in several categories. Registration fee required. Contact Annett&apos;s Mono Village - (760) 932-7071 for more information. August 31: Free Fishing Day - Come and fish for FREE in Mono County! All regulations still apply and Report Cards are required -- but Fishing Licenses are waived on this day. For more information on Mono County fishing regulations, contact the California Department of Fish & Wildlife at 760-934-2664 or visit the website for more information. August 31: Fishin&apos; Mission Foundation Western BBQ & Concert - Bridgeport. Contact the Fishin Mission Foundation for tickets. September 2 - November 15: "Ambush at the Lake" Fall Fishing Derby - Convict Lake. Catch a tagged fish at the Convict Lake Fall Fishing Derby Series and win thousands of dollars in cash and prizes! Contact Convict Lake Resort - (800) 992-2260 for more information. October 26-28: Morrison&apos;s Bonus Derby Weekend - Convict Lake. Cash Bonus Derby Weekend. Contact Convict Lake Resort - (800) 992-2260 for more information. For more information about these fishing events, other sports events, music festivals, food/beer/wine celebrations, and more great events, check out our full Calendar of Events.